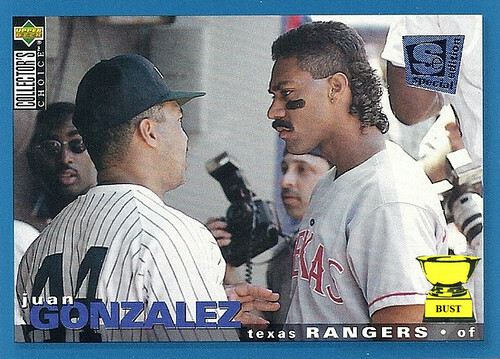 It's a collector's choice pop quiz: What did Reggie Jackson say to torque off Juan Gone? A) Reggie asked why Juan put so much eye black on his lip. B) Reggie asked if Juan realized that there would be photographers around. C) Reggie told Juan he had a nice swing and then asked if Juan's husband played. D) Mr. October said Juan reminded him of Miss November. E) None of the above. Juan just didn't like anybody. Disappointed you wasted such a prime card with a pop quiz. Incidentally, did anyone notice Tupac in the background lol.